An amazing collection of cars was made available for public viewing last weekend, and at the same time, a young burns victim from Buriram benefited from charity donations pledged at the event. 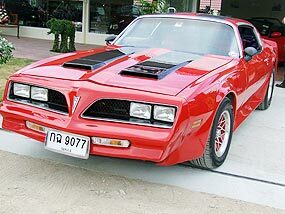 John Richardson’s classic car collection includes this beautifully restored Pontiac Trans Am. The car collection is owned by John Richardson, the MD of the UTS steel fabrication company and a car enthusiast, who these days is keeping a team of three auto restorers in full time work, returning the old cars to their former pristine glory. This they do so well, that John’s immaculate red 1965 Ford Mustang won the best presented car in Thailand award last year. Amongst the collection of more than 20 vehicles were some American muscle cars like the Pontiac Trans Am and Mercury Cougar, plus classic Europeans such as the Alfa Romeo Spyder (famous as the car used in the movie The Graduate), the Porsche 928 (the V8 front engined Porsche) and four Mercedes Benz (500 SEC, E 220 AMG, S 500, SL 450) plus some significant British sports cars in the Mk II MGB and the Triumph Spitfire Mk III and a brace of V12 XJS Jaguars and a Lotus Elan Turbo. John also has an Austin Healey 6 and a couple of Armstrong Siddeleys (1947 Hurricane and 1951 Whitley) under restoration at present. Incidentally, when the hood lining was peeled back on one of the Armstrongs, the wood across the top of the windscreen was still intact, complete with chalked on date of the actual build. Those were the days of hand-built cars - while these are the days of hand-built restorations! 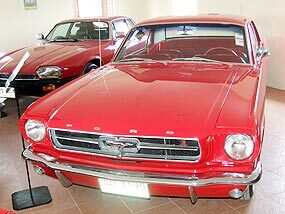 John’s immaculate red 1965 Ford Mustang won the best presented car in Thailand award last year. All the cars were found in Thailand, and John is to be congratulated on making sure that auto history is being preserved locally. John Richardson and his family also took the opportunity to donate 100,000 baht to the Charity Club of Pattaya, which was then equaled by Frank Lawton and family from the Australian Wearside Constructions, and this was presented to Christina Boden. The 200,000 baht will be used to allow further plastic surgery to continue in Bangkok on the young burns victim from Buriram. Last week I mentioned the film The Graduate and Guidobaldi Trionfi of Brescia had much in common. Guidobaldi won an Alfa Romeo which starred in the movie, after giving the model its name. What did he call it? He called it the Duetto. So to this week. How did famous body builder Pinin Farina get his name? You can glean more information on what is going on in the automotive world from the daily financial pages than you can do from many auto publications. Little snippets such as Alexei Miller, the head of Russia’s Gazprom, predicting crude oil to be $250 a barrel next year. At that rate you will need to take out a loan to buy fuel at the weekend. However, the head of BP, Peter Sutherland, did not agree, and had some good news in the fact that his company said that oil reserves would meet current production for the next 41 years. So much for the “about to run out of fossil fuels” movement! My Daihatsu Mira will be pleased. BP boss Sutherland also said that the main factors for the increase in price were “increased demand, a shortage of investment in developing new oil and gas resources and political instability risks in production areas such as Iraq, Venezuela and Nigeria.” I find that very interesting, as the oil companies are currently recording their greatest profits ever, but are apparently not reinvesting the money in developing new oil and gas resources, thus keeping the price of oil up. Hmmm! With Asia having become more involved with motor sport and new purpose-built F1 tracks in Bahrain and Turkey along with Malaysia, Singapore, Japan and China, Asian circuits currently represent 33 percent of the F1 races in 2008. India is coming, and even more by 2010. Bernie Ecclestone, the F1 supremo, has made no secret of the fact that he believes the future for F1 is in Asia! Believe him. Globalization is Go! So if the future is here, this goes a long way towards explaining why the local Asian series in the other categories are attracting overseas entries as well. So back to the smallest formula first, that of BMW Pacific, and out of the 14 drivers racing in this Asian series, there are two from South Africa (including a female driver), Hong Kong is represented, a Korean American, five Malaysians, an Indian (who is the protégé of Narain Karthikeyan, the first Indian driver to make it into F1), a Filipino, a Colombian and a Japanese driver. That is certainly a broad spread globally. The Porsche Carrera Cup is equally international in its Asian series. It has five drivers from Hong Kong, four from Singapore, three from Australia plus Germany, UK, Indonesia, Malaysia and Sri Lanka. With Singapore having made the investment in its own F1 race (and the first to be run at night), it comes as no surprise to me to see four drivers from the island state. What is even more interesting is the nationality of the entrant teams, with three Chinese, three Australian, three from Hong Kong, plus Indonesia, Sri Lanka and five Singaporean cars. Again the effect of F1 on motor racing in that country is all too obvious. With motor racing being a global phenomenon, it really needs the respective national governments to pick up the tab, bite the bullet and build the circuits, which in turn will increase the number of cars and drivers competing. Thailand and the Philippines have local series, but the tracks need upgrading to a higher international standard to allow their national drivers to compete against overseas drivers on their own soil. It is significant that whilst there is the talent in the Asian countries, the sponsorship investment to get the Asian drivers better represented on the grids is not there. There have been a handful of Thai based drivers, for example, but they have been basically self-funded, finding it very difficult to get backing nationally. The automotive world seems to be caught in the fuel price spiral, and several manufacturers are putting forth hybrid gasoline-electric vehicles as the answer to the cost of running factor. Foremost amongst these is Toyota, with its Prius being the most successful hybrid available in the world. The hybrid technology is being extended into more of the Toyota (and Lexus) range and the very popular Camry will be next to be offered with a hybrid propulsion unit. Toyota have confirmed that Thailand and Australia will be the next two centers to produce the hybrid Camry, with line modifications for the new Camry’s already started. The Australian government has been pushing for the car to be built there and has even given Toyota $35 million (around one billion baht) as an incentive. Australia’s prime minister Kevin Rudd flatly rejected assertions that the $35 million given to Toyota was a subsidy and said it was important to encourage new technologies. “It’s not a production subsidy,” he said. “It’s about setting up a new business. Good for motorists, good for fuel efficiency, good for the car industry in Australia, good for the environment.” All very philanthropic. However, the president of Toyota, Katsuaki Watanabe, said the $35 million was very much appreciated but he was unsure how to spend it! He suggested it could be used to subsidize the cost of the car, despite what the Aussie PM had to say about the money not being a subsidy. “It was only recently that we heard about the amount so we are not sure how we will use it,” he said. Both the Thailand and Australian hybrid lines will be producing around 10,000 hybrid Camry’s each year, beginning in 2010. It is rumored that the hybrids will cost around another 150,000 baht over a regular gasoline engined Camry, though this may be well off the mark. At the same time, the financial pages were reporting the joint venture between Toyota and Matsushita Electrical (Panasonic) to go into full scale production of lithium-ion batteries in 2010 for the hybrids. Nissan and Mitsubishi have also joined with NEC and Yuasa to produce lithium-ion batteries for their yet to be released hybrids. 2010 looks to be an interesting year (and I predict that by 2011 there will be replacement Chinese knock-offs as well)!